Heading up the east coast of the island the sun finally came out. 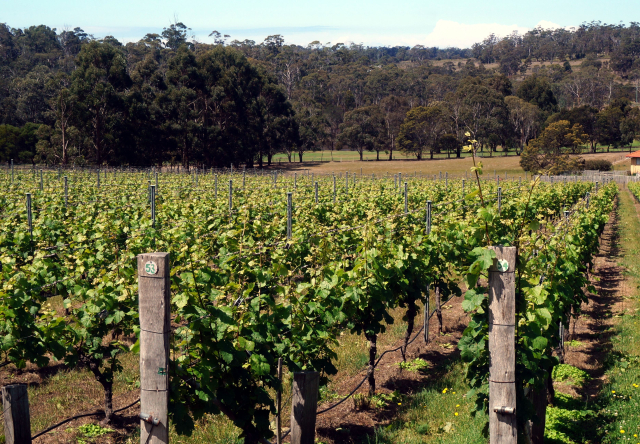 The Darlington Vineyard in Orford was a very pleasant visit with the winery’s owner and farmer. He produces five wines – 250 cases per year in toto. His Riesling is most worthy of the critical awards garnered. Tasmania roads are excellent. They are superbly maintained and signed. The top speed is 60 mph – with 50 mph anywhere there is development. Main roads are two lane. Drivers are polite and don’t tailgate - that’s if one sees any other car. We drive for an hour and rarely have another car going our way. The landscape is occasionally mountainous, frequently rolling grasslands, and even more frequently forested with eucalyptus. The experience of driving is calming and beautiful.